Being part of Campus Crusade for Christ during my college years is something I’ll always be grateful for. Prior to joining CCC, I didn’t know how to share the gospel. I also wasn’t part of a discipleship group so naturally I didn’t know how important being part of a small group was, until I joined CCC. There are a lot of great things to take away from being a member of a campus-based ministry such as CCC. I always encourage students to join campus-based ministries because it’s one of the best ways to maximize the opportunities in college as a Christian student. Though I admit that it’s not a perfect organization much in the same way the church is not perfect, I think even those who didn’t have as great an experience as I had will admit that involvement in these organizations helped shape or build the foundation of our faith. Let me equate involvement with CCC as the same as involvement in a small group which, in essence, it is. In CCC, I learned how to effectively communicate my faith and share the gospel. We used tracts, the famous yellow booklet known as The 4 Spiritual Laws. I learned how to deepen my faith intellectually and practically. Through CCC, I also was able to do Classroom Evangelisms (CE) where we share the gospel in classroom settings inside our campus. Having this kind of experience does something to your confidence – not in yourself, but in God’s power, because we always were aware that unless God moves, everything is in vain. I have shared the gospel to countless number of people through my involvement with CCC. I’ve also encountered all kinds of people while witnessing – from atheists, to agnostics, to intellectuals, to leftists – and have gotten a fair share of rejection, persecution, and mockery because of my faith. But I’ve also met eternal friends in CCC – friends who journey with me through my ups and downs and everything in between. I can say I had a great college experience because of my involvement with CCC. And slowly, I saw that the things I had gotten used to doing while in college – sharing the gospel spontaneously, conducting bible studies and building my discipleship group – faded, one by one. I think for the graduate who just left the ‘home’ he has known for 4 years of his life, there are three great challenges: continuity, consistency and commitment. I find this truth at work here: Being involved IN a campus-based ministry is a preparation for life OUTSIDE the campus. That is, even after leaving what may be considered your comfort zone, you can go on your way because you have been equipped. At least, that’s what we all hope and pray for. My whole point is this: Many young Christians, myself included, when we graduated from college, our ‘involvement’ in doing God’s work also graduated – when it shouldn’t be because doing God’s work should be our lifestyle. Or maybe, in the first place, Christians weren’t doing God’s work to being with. It’s not about being a missionary in the sense of going out THERE – realistically not everyone can, but we are to be missionaries where God has placed us – to become a blessing where we have the opportunity. This truth was never more pronounced in my life than when I joined the OJ Bicol, organized by no other than Campus Crusade for Christ, last April 23-30, 2013. Photo taken from PCCC website. The ‘format’ of OJ has largely been the same every year – mass evangelism, high saturation. Share with as many people as we can, then turn them over to the partner local churches. Of course God has done many mighty things through the OJs before and it has resulted in a lot of saved lives – but this year, the format of OJ was changed to adopt the T4T method. One of the ideas behind T4T is equipping by training Christians, in the case of this OJ Bicol, the church member, to train other Christians who will train other Christians to build home churches. It is essentially a church-planting movement designed after the Acts New Testament account. There was a realization that the greater need lay in the equipping of the local churches because without it, they will not be able to effectively follow-through the people who received Christ during the OJ evangelism in their areas, nor will they be able to ‘replicate’ the process. There was a need to empower them so that even after the OJ is finished, they can continue the work that was started. This was the premise and goal of the OJ Bicol. The assigned area for CCC-IloCor (Ilocos-Cordillera, where I am part of because I’m an alum of UP Baguio) was Manito, a small town and not even a city of Bicol. I mention this because the original vision behind OJ Bicol was to target “key cities”, the largest cities, of Bicol. God had orchestrated the circumstances so that this seemingly insignificant town of Manito became, against all odds, part of the OJ – and it was a fulfillment of many faithful men’s dreams. Kuya Aboy – one of my favorite speakers (He was the speaker on my first CCC event during my 1st year, 2nd semester) and a fellow alum of UPB and CCC , is from Manito. He was the driving force behind the OJ at Manito. He wrote this backgrounder on the state of his home town. This church is composed of people living in a predominantly agricultural community and is among the poorest municipalities in one of the poorest regions in the Philippines. All economic activities are based on small scale farming and fishing. Commerce is limited to a handful of stores. The town center itself is only comparable to mere barangays (small villages) in other municipalities. I honestly didn’t know what to expect when we arrived at Manito, because we ourselves were still learning the T4T method, and we had to teach/train members of our partner church this concept. But God, as always, He worked it out and after several days of familiarization and training, we saw our “trainees” on their way to live out the T4T concept and reach out to their families, neighbors, and just people they have been praying for. It’s been almost a year since that life-changing OJ/immersion/missions. I can still remember how God worked powerfully on our trainees’ lives that week, where they boldly went out and reached out their neighbors, shared their life stories and ultimately led them to Christ. I remember my trainee, ate Lea. At the time, she recently started a small bakery tindahan inside her house. She is married and has two daughters. Her testimony is quite incredible; she discovered God in Manila while looking for her biological father at the age of 13. She has since then come back to Bicol and start a family. As with most people from Manito, they are very poor. Over the course of 7 days, I ‘mentored’ her and spent time with her at her house in the municipality of Balasbas near Manito central, where we stayed. It was truly a blessed and humbling experience seeing their way of life. Despite her situation, she is a faithful follower of God. In fact, she has opened her home to be a home church in Balasbas. During our meetings, I noticed that the bible she was using was a Catholic Bible. It was old and very tattered. I also noticed that her kids do not have children’s bible. She also had only one recipe book (from Booksale) from which she gets her bakery store recipes. I remember a few weeks after OJ that I messaged some friends in Facebook asking for help because I had limited means as a student. I wanted to send ate Lea bibles for her and her children, baking books for her business, and anything that could bless her. I was blessed with the willingness of friends to help. In fact, one friend even asked if there is something else we can do to help her livelihood. What struck me during and after the OJ was the reality that MOST of the local churches that REALLY need the help (financial, trainings, etc) of the church, the body of christ–christians–are not in the city, thus they are poor and are in far-flung areas. Kuya Aboy made a very compelling point when he mentioned that there has to be a ‘tension’ in the church, where the rich christians should experience being or living with poor christians–and how this just couldn’t be. The fact of the matter is, majority of Filipinos are in poverty, and the reality is that the resources of the church are focused on the few–the middle class–when we should perhaps be equally focusing on reaching out the “unreachable”. It’s a classic missions situation–budget of most churches spend so much more on the building and other stuff than on missions. I have nothing against “mega churches” – I belong in one, in as far as it being a BIG church. I do grieve, after my experience at Manito, at the fact that there could be so much more well-off churches can do. Or, just plain individuals who can give and use their resources to help small, local churches who are IN the thick of the battle for souls–they are right at the center of where poverty is–and they need training, and finances to sustain their churches. There is nothing more fulfilling and humbling than being an instrument by God to accomplish his will – that people will go out and make disciples of all nations, teaching them to obey God and His words, bringing real hope and the good news of Jesus Christ. I started this post by detailing my experience with CCC – it has given me so much exposure to the real work that lies before us, and I truly pray that Christians will actively seek to be involved in missions, be it short or long term–and in church planting–in small groups and making disciples, because I believe that is how we will reach everyone. From Passion & Purity, a timeless book every Christian should read. That the Word of God shall stand forever – No one and nothing will be able to destroy the Bible. Many attempts have been made, many have tried to discredit it and change it, but God’s word will stand. The importance of being strengthened and nurtured by the Word of God everyday. 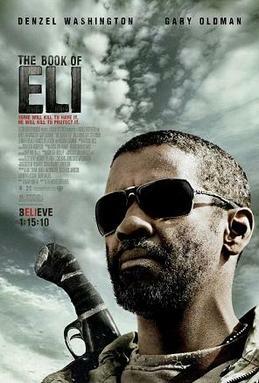 In the film, Eli relied on the book for his daily sustenance – as if his life depended on it. And it did! The book nurtured him and sustained him like it was the air he breathes. (Although in the film it was illustrated rather physically), The Bible gives strength to us to fight our daily battles. We live in two worlds – the physical and the spiritual. And we indeed battle against principalities, powers, and spiritual wickedness in high places. This film reminded me to always be prepared. 13 Wherefore take unto you the whole armour of God, that ye may be able to withstand in the evil day, and having done all, to stand. 14 Stand therefore, having your loins girt about with truth, and having on the breastplate of righteousness; 15 And your feet shod with the preparation of the gospel of peace; 16 Above all, taking the shield of faith, wherewith ye shall be able to quench all the fiery darts of the wicked. 17 And take the helmet of salvation, and the sword of the Spirit, which is the word of God. Write everything exactly as I say it. It’s a tall order and it is challenging, but we should all try and do it.